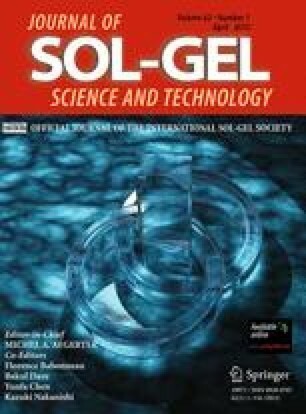 In this paper, antireflective TiO2 thin films have been prepared on single crystal silicon, and textured polycrystal silicon by sol–gel route using the dip-coating technique. The thickness and the refractive index of the films have been optimised to obtain low reflexion in the visible region, by controlling both the concentration of the titanium isopropoxide (Ti(iOPr)4), and the annealing temperature. We showed that the use of a TiO2 single layer with a thickness of 64.5 nm, heat-treated at 450 or 300 °C, reduces the reflection on single crystal silicon at a level lower than 3% over the broadband spectral ranges 670–830 nm and 790–1010 nm, respectively. In order to broaden the spectral minimum reflectance as much as possible, we have proposed to texture polycrystal silicon wafers, and to coat these wafers by a TiO2 single layer with a thickness of 73.4 nm. In this case, the reflectance has been reduced from 27 to 13% in the spectral range 460–1000 nm.